Guideline Is No Guarantee Insurers Will Pay For Pill To Prevent HIV : Shots - Health News Truvada, an AIDS drug, is expensive, with an annual price tag of at least $10,000. High copayments are a real possibility for people, even those whose insurance covers use of the drug for prevention. Dr. Lisa Sterman held a Truvada pill at her office in San Francisco in 2012. She prescribed Truvada to patients at high risk for HIV infection even before the Food and Drug Administration approved the medicine explicitly for that purpose. Now that the federal Centers for Disease Control and Prevention recommends a daily pill for people at substantial risk of becoming infected with the virus that causes AIDS, how likely is it that someone's health insurance will pay for it? First off, the CDC recommendation isn't binding. Insurers aren't required to cover the drug for prevention at this time. The CDC clinical guideline, released early in May, does carry quite a bit of weight, though. 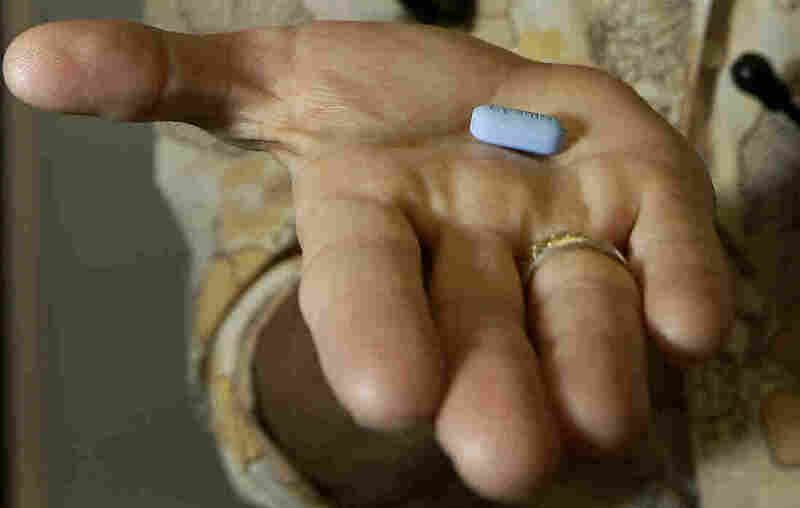 It recommends that people who are at substantial risk of becoming infected with HIV, the virus that causes AIDS, take a daily pill called Truvada. This pre-exposure prophylaxis approach, called PrEP, can prevent HIV infection in more than 90 percent of cases. Although insurance typically pays for the drug, it's expensive, with an annual price tag of at least $10,000. High copayments are a real possibility for people with coverage. Under the health law, most health plans are required to cover without any cost sharing by patients for those preventive services that are recommended by the U.S. Preventive Services Task Force. But that hasn't happened yet for HIV prevention with Truvada. The task force, a nonpartisan group of medical experts, analyzes the scientific evidence related to clinical preventive services and makes recommendations about their use. At this time, the task force recommends HIV screening for people aged 15 to 65. It doesn't have a recommendation on preventive medications for HIV/AIDS, nor is any such review in the pipeline, according to a spokesperson for the task force. "The task force bases its recommendations on a thorough review of the current evidence. When making a recommendation, the task force considers the recommendations of other groups, including the CDC," the spokeswoman said.